LAWYERS FOR THE partner of a garda whistleblower have given details to the Charleton Tribunal of an argument which led to a 999 call in April 2013. In its current module, the tribunal is investigating contact between An Garda Síochána, Tusla (the Child and Family Agency) and Garda Keith Harrison. 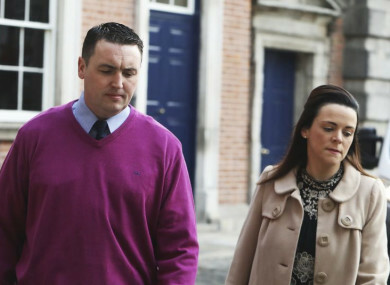 Tribunal chairman, Mr Justice Peter Charleton, had asked lawyers to clarify details of an incident which led to a garda patrol car being sent to the house in Churchill, Co Donegal where Harrison and his partner Marisa Simms lived, in the early hours of 1 April 2013. In a statement made to gardaí in October 2013, Simms said Harrison was “out of control” and that she was pulled by her arm from her bed and pushed out the front door in her pyjamas. She later withdrew this statement. “There was certainly a row in the sense that there was an argument between these two,” Hugh Hartnett SC said, responding to questions from the tribunal chairman. Hartnett is representing Simms at the tribunal. “Certainly voices were raised by both parties and there is no doubt about that,” Hartnett said. The barrister said a duvet was pulled off the bed, but Simms was not pulled out of the bed by her arm. “She went out onto the street in her pyjamas and a coat over them, as she awaited the arrival of Mr (Jim) Quinn,” Hartnett said. Quinn, a self-employed counsellor and faith healer, earlier said he travelled to Churchill after receiving a phone call from Harrison. He said he was not confused about who had called him and that the phone call had been from Harrison, not Simms. Hartnett said when Simms was contacted by GSOC, the Garda Síochána Ombudsman Commission, her reaction had been to withdraw her statement. The barrister also said Harrison did not bang a dashboard with his fist, but “there was a throwing of keys against the dashboard”. He said the statement Simms had made to gardaí was “intrusive and unnecessary”. Mark Harty SC said it was not Harrison’s position that Garda HQ had directed Tusla to investigate him, but that such a direction could have come from gardaí in Donegal. William Bogle said that in the early hours of 1 April 2013 he received a phone call from his sister Rita McDermott, Simms’ mother. As a result, he phoned Letterkenny Garda Station, concerned about his niece’s safety. A recording of the 999 call was played, during which Bogle said Simms was living with “a garda in Donegal town” and he was “giving her awful abuse”. Bogle reported that Simms had been “put out of the house”, and that there were children in the house. Bogle’s daughter Kerry was also heard on the call, saying Harrison was “being very aggressive and he’s chasing after her”. Bogle also called to Letterkenny Garda Station, where he spoke to Garda Tina Fowley. Questioned by Harty, who is representing Harrison, the witness agreed he had no factual information and was relaying Garda hearsay he had received from McDermott. Harty told the tribunal his instructions were that, following a disagreement, Simms indicated she wished to go back and stay at her mother’s, and because both he and Simms had been drinking and could not drive, Harrison rang Quinn, who collected Simms and brought her to her mother’s house. Kerry Bogle said when McDermott called she learned that Simms was “walking the street in nightclothes” after an argument. McDermott asked that they check in to make sure Simms was okay. She got in a car with her father and they drove along the road to Churchill, but did not see Simms. They then went to Letterkenny Garda Station. Garda Ian Oates, who took the 999 call from William Bogle, said he did not realise initially that Harrison was a garda. He said, once he realised who Harrison was, he informed his sergeant. Sergeant Aidan Doherty, the supervisory sergeant on duty in Letterkenny, said he initially thought the report was that Simms “was in one car, being pursued in another car by Garda Harrison”. He eventually established the address when he spoke to McDermott, who described Harrison as “having a problem with alcohol” and told him that Simms was “thrown from the house”. Doherty said that when gardaí called to the address in Churchill the house was dark. When they learned Simms was “safe and well” and being driven to Raphoe, they left the scene. Garda Eoin Waters said he was contacted by Doherty and “made aware of an alleged domestic incident that occurred”. He travelled to the address in Churchill, but “there was no answer at the house, the house was in darkness”. Waters also said that, on another occasion, Inspector Goretti Sheridan gave him a phone belonging to Simms and he made a copy of voicemails from Harrison to a dictaphone. He then returned the phone to Simms. The chairman said the tribunal had transcripts of the voicemails. Email “Tribunal hears details of fight between garda whistleblower and partner that led to 999 call”. Feedback on “Tribunal hears details of fight between garda whistleblower and partner that led to 999 call”.